This object is a plaster cast of a frieze from the entrance of the Temple of Ptah at Karnak and shows Ptolemy III giving offerings to the gods Imhotep and Ptah. The plaster cast was made in Cairo Museum in the 1930s by putting rubber over the relief, pealing it off and using the rubber as a mould, which was then filled with plaster of Paris. It came to us from the Wellcome Trustees in 1982. 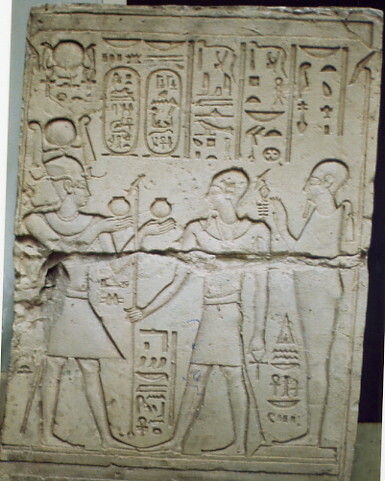 As stated above, Ptolemy is shown offering to Ptah and Imhotep. Imhotep had been a doctor, high priest, scribe and vizier of the pharaoh Djoser of the 3rd Dynasty. During the New Kingdom (1550-1069 BC), Imhotep was deified as a god of healing. Ptah was one of the oldest Egyptian gods known and appears as early as the 1st Dynasty. He was the great god of Memphis but over time his influence spread further. He was worshipped as Ptah the craftsman, Ptah lord of Memphis, Ptah the creator, Ptah hearer of prayers and was a chthonic and afterlife god. Ptolemy III came to the throne when he was 30 years old (in 247 BC) after being raised by Arsinoe II, his stepmother. When he became king he married Bernice, the daughter of Ptolemy’s half-uncle, Magus. Magus was the king of Cyrenaica. Soon, Ptolemy was called to Antioch to support his sister who was also called Berenice. The sister was the wife of Antiochus II of Syria. Court intrigues by Antiochus’ first wife, Laodice, led to the death of Antiochus by poisoning. Before Ptolemy could reach the city, his sister and her young son had also been killed. Ptolemy sacked Antioch in revenge for his sister and his nephew. He then campaigned deep in Babylonia. His wife Berenice was left in charge of Egypt with a panel of advisors. However, dissent caused Ptolemy to return. After subduing dissent he began a series of building and refurbishment projects. In his tenth year of reign he began the construction of the great temple of Horus at Edfu. The temple was officially opened in 142BC, during the reign of Ptolemy VIII. 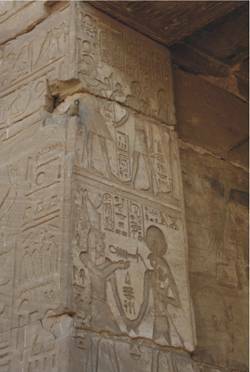 Ptolemy III also refurbished the temple of Ptah at Karnak, from when this relief frieze derives.